I posted these tonight on my Facebook, and since the recipe was requested several times, I decided to not wait till tomorrow. In fairness, I had no compelling reason to post it tomorrow, except I wanted to show off the bento with the cupcakes first, before sharing the recipe. So promise you'll come back tomorrow and ooh and ahh at the bento too? Either way, simple simple recipe. We've sampled them hot and cold and they are good both ways. I may start experimenting with homemade meatballs and other types of pasta (I bought standard white spaghetti for this, we usually do whole grain; and we had bought really cute mini frozen meatballs). But for now, we used easy to find, easy to prep items! Prep a muffin pan and spray well with non-stick cooking spray or brush with oil. Boil water, break the spaghetti noodles in half, cook per package directions. Drain, rinse with cool water so you aren't working with hot noodles. Mix noodles with one well-beaten egg and 1/4 cup grated parmesan cheese. Place a scoop of noodles in each muffin cup, in kind of a nest-like formation. 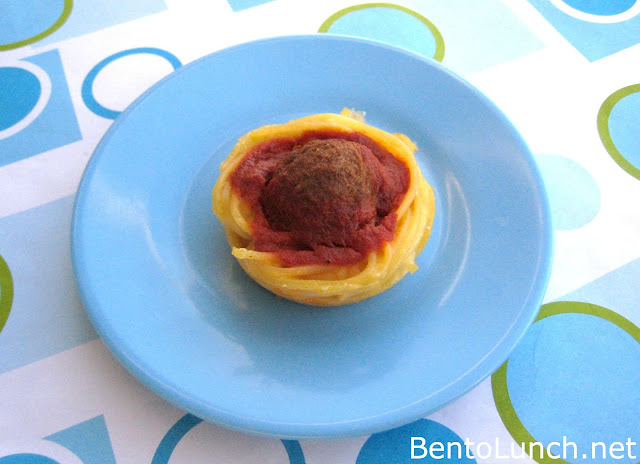 Place a frozen meatball in the middle of each cup (again, think like an egg in a nest). Spread a teaspoon or two of spaghetti sauce around the meatball; do not spread to the edges, it will stick. Bake for about 20 minutes at 350 or until the pasta sets. **I used the edge of a butter knife to loosen the cupcakes before removing them, and cooled them on a dinner plate instead of a rack, to make sure they didn't fall apart. ***We also have vegetarian "meat"balls in the freezer from a blog review. I see vegetarian potential in these too. As well, a friend just pointed out that they could be gluten free by switching the pasta and making your own meatballs (or using GF ones). My girls will LOVE this and perfect portions for them too! Thanks hun for sharing!! Great idea! It reminds me of a mini version of Spaghetti Pie. Just dropping over from playtime...what a great idea and wonderful blog you have here! Your newsest follower as i think your blog shall come in very handy for feeding my twin toddlers!! I love your muffins recipes and now your cupcakes:) Wonderful idea! My young lady will love this... going to check out the Bento now! I will have to try this sometime! I love it! I did something with muffin tins tonight that has me excited for tomorrow, too, so I understand the feeling, but I think you're more creative with yours than mine. I'm a little behind the times, but I absolutely LOVE this idea! I'm all about quick and easy, cute and smaller portions. I'd rather they ask for more than give them too much and have it go to waste.